It has been almost a year since I rededicated my life to Jesus Christ. Before that, I had been away from my faith for about fifteen years. During a difficult cleanout session, I had to discard several Bibles that I had owned for many years because they were starting to mildew because of being in storage. It was painful. Yes, mine looks just like this. I began to replace them. But I was not going to get carried away, needing to own over a dozen versions like I had done in the past! In an online forum, someone had recommended the English Standard Version. I had never heard of it, so I read up on it and then bought one. (It is almost funny, I was starting to get teary-eyed in the Barnes and Noble store as Malcolm and Alwyn's wonderful song was playing in my head.."Got myself some wisdom from a leather-backed book...") It felt...strange. Strange, and yet very good, to be reading a Bible again after so many years. Then I looked for the little green Gideon New Testament I had been given several years before, to no avail. But I really wanted a pocket-sized New Testament, so back to Barnes and Noble for a pocket New International Version. I will not bore you with the details of my further acquisitions, but for me, there is no such thing as one Bible. Advice given by Matt Slick of CARM as well as others is to have at least three good versions, and to be familiar with them. So, I am rotating my NIV, ESV and New American Standard Bibles. The liberal-leaning Revised Standard Version from my childhood is still intact, and I will not part with it. 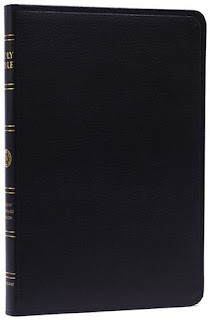 Since the Holman Christian Standard Bible has just been updated, that is also on my purchase list. But I am not a clutterer or accumulator, even if it is in the name of "research", or "reference". In other Weblogs, I have gone on about "decluttering" and "minimalizing". After all, our existence is not defined by our wealth or our possessions. Ironically, I was seeing the spiritual value in getting rid of the junk in my life (if it has sentimental value, how much is it really worth if it is boxed away and forgotten until the box is investigated again? ), and I had to get rid of clutter. The library was very thankful for the several boxes of books that I donated for their book sale — including Bibles that were in acceptable shape. Being rational in my possessions is getting easier, except for books. Especially Bibles. I really like Bibles! The smell, touching, reading, all of it. Yes, I can hoard and research to my heart's content with theWord, but let's face it, Bible software is not as pleasurable. 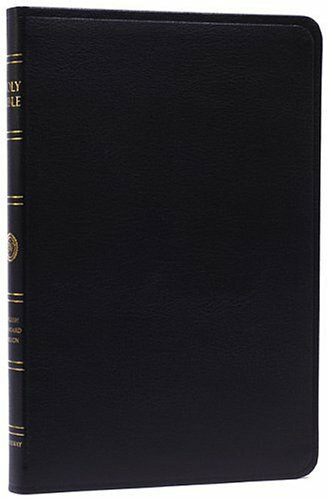 Also, doing research for upcoming articles has made me aware of some other Bible editions that I had not know about previously, and I have to tell myself, "No, that is not in the budget..."
There IS something precious about that goodly Book!!! I use my online stuff when I need refs for the net...but when I want to get alone with the Lord and I really want to hear Him speak to my soul- I want my leatherback! You know- just talking about It makes me wanna pull It close and go hide out in the closet! It is Life! How old was that kid? I need to let my older kiddies hear it, they'd crack up. I would guess that he was in his mid-20s. Isaac Air Freight was comprised of three guys, and this album was released back in 1978. Some of their stuff was inspired, and some...whatever.